Serendipity Reviews: Writing Words - Standing With An Army. Writing Words - Standing With An Army. Firstly I want to thank everyone for all the support I received last weekend after publishing the first ever Writing Words post. I had toyed with the idea of doing something like this for such a long time, but I was afraid I would be laughed at, ridiculed because I'm no where near becoming a published author. What could I possibly have to say that would be of interest or even slightly beneficial to other writers? Well you all proved me wrong. The support was AMAZING! I've never had such a positive response from a blog post before. I couldn't believe it. Everyone knows me as a book blogger, but I haven't let anyone into the personal hell of my writing world for quite a long time, so it was really lovely to see so many people on my side. It was the support you all gave that led me to writing this week's post. One by one, you stepped up to my platform and you never left me standing. Your voices joined in with mine and as I looked around I realised - in the words of Ellie Goulding - I was standing with an army. A writing army. And we were ready to support each other and carry each other over the finishing line. As we all know writing is one of the most loneliest journeys ever. But it doesn't have to be. If you are lucky, you have the support of your closest family and friends. My husband, Darren, has always believed in my writing. He has believed in me, when I haven't. He picks me up when I have a major melt down. He's stopped my laptop from having many an early demise. He makes me see the bigger picture, when all I can see is the most difficult jigsaw puzzle I've ever had to complete. But he isn't the only support I have. I know we moan and whinge about how social media can be detrimental to our writing as well as our sanity, but there is also a beneficial side to it. Though social media I found my closest cheerleaders. Without it, I would never have met one of my biggest and most supportive cheerleader and unofficial mentor, Lara Williamson. Lara is the author of two amazing and very successful Middle Grade novels ( A Boy Called Hope and The Boy Who Sailed The Ocean In An Armchair). She is always ready to guide me through the bad times. She picks me up again when I've lost the will to write and she literally reads and edits everything I write. Everyone needs someone like Lara in their life. Without Twitter, I would never have joined SCBWI. SCBWI allowed me to talk to other writers in similar situations. 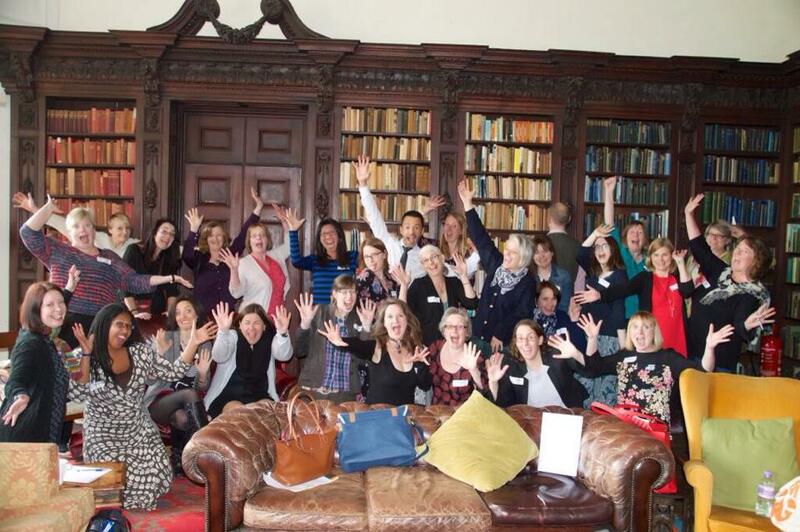 I get to attend events such as Masterclasses which help to increase my writing knowledge and agent meet and greets. It also brought me to my local SCBWI group whom I meet with once every month. Kathryn Evan, Liss Norton, KM Lockwood, Elizabeth Dale, Jill Atkins, Chrissie Gibson, Jackie Wilson and Lizzie Strong - there is some serious writing talent in this group. When we meet we talk about all that we have or haven't achieved in the previous month. We have to set targets for the following month and Liz Dale will check to see that you are keeping on track. They are the most morale boosting group of people I've ever met and I would be lost without them. Quitting is not an option. I always come away motivated and ready to write more words. Some of my wonderful SCBWI group at Kathryn Evan's book launch. Without SCBWI, I would never have attended the first ever Book Bound retreat organised by four giants within the publishing industry. Combining their knowledge and years of experience, Sara O' Connor, Sara Grant, Jasmine Richards and Karen Ball, brought together a group of extremely talented authors and helped us learn the tools we needed to push us into publication as well as helping us build a support network that is still very much intact two years after the event. And then there is the newly formed Wordcount Warriors. A place where I have to own up to my word count and / or editing every day. Now that is really keeping me motivated. Don't walk this writing journey on your own. I'm not saying you won't reach success, because I'm certainly not Mystic Viv. But I do know your journey will be easier if you are accompanied by an army. Many writers I know attend Arvon retreats or have joined The Golden Egg Academy, so there are many options available for you to choose from. So I beg of you, don't write alone. There is no need. Network with other writers, join critique groups and go to as many writing workshops as you can afford, because its through these that you create your support group. You will build your own army who will stand by your side as you make that journey to publication. And you are always welcome to join my army. My personal writing achievement this week. I FINISHED THE FIRST DRAFT OF MY 5 TO 7 YEAR OLD BOOK!!! 8,012 words ready to be edited. Whoop! Whoop! Go me! Actually I don't want to make this sound as easy as it is coming across. It has taken me all month to write this piddly amount of words, but considering I didn't write a word last month or the previous few months, I'm feeling pretty chuffed with myself. This is a very moving post. I'm one of many, many people who has experienced your support. You have a large army Viv! Thanks, Sue. Always there to support the BookBound Army. And can I just say how much I love this post! Aw you are lovely, Jesse. Thank you very much. Thanks Emma. It's good to know that published authors still feel the same things as the rest of us. And congrats on your word count! Managing to pen down words of any length is always an achievement! As for me - Its been a week now and I've finally stopped refreshing my inbox to see if any agents have responded (none have so far) - most because I finally realised it was Easter weekend in England so my queries will probably be clogging up some poor agents computer next to a thousand others... but now I'm settling down and plotting out my next novel. Cant wait to jump back into writing! A lot of the agents are in Bologna this week as well, so I wouldn't expect an answer for a couple of weeks. Always move on. Forget what you have sent out and start something new. This was sound advice given to me by Sara O'Conner and Sara Grant.